From design to build to programming and troubleshooting, RBT Electrical and Automation has the skills to provide world class solutions for all the unique challenges facing our clients. For over 18 years we’ve provided leading design and manufacturing of automation and control systems across varying industries including manufacturing, food production and automotive. As your single source contractor for electrical, automation and control services, RBT Electrical and Automation can save you time, money and hassle in coordinating your project. We can complete full system installations and take you from the design/build stage to installation and through to production. Trust in our full-service custom solutions, leading technology and best practices tailored to your automation requirements and environment. Your control systems are the heart of your operation. You can count on RBT Electrical and Automation to provide solid solutions that are reliable, efficient and engineered for safety. We install and code controls and equipment fit for your process and environment. 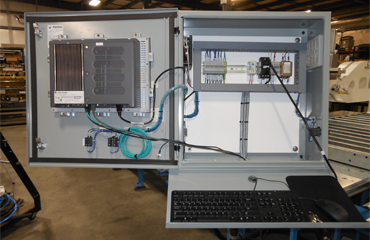 We provide complete automation electrical control design, including panel and cable layouts. From small projects to large full-scale implementation, we can meet all of your project’s needs efficiently. RBT Electrical and Automation Services provides comprehensive and integrated safety solutions to protect your employees, your machines and your facility. Through our consultation process, RBT designs, manufactures, retrofits and installs the necessary solutions and technologies to ensure your manufacturing and processing systems are safe and efficient. We can design, fabricate and install high-quality control panels for all types of industrial, manufacturing and commercial facilities. Our panels can be custom-built to meet your requirements, or created from provided prints. From installation to upgrading, RBT Electrical and Automation can ensure your motor controls are finely tuned for your needs and compliant for your industry. When you’re looking to upgrade your systems trust RBT Electrical and Automation. We have extensive experience upgrading machines from old relay logic to program logic. All machinery used in Canada must be approved for such use. RBT can help you get your equipment approved. With our extensive knowledge and experience in inspecting and modifying machinery, and working with inspection agencies, we can help remove the stress from a seemingly daunting task. At RBT, we keep your company running with full service Electrical & Automation. Contact us today for industrial automation and control, electrical services, motion control, PLC programming, construction and maintenance.